This Event will be held at our Ybor City location. Admission to the Wine & Chocolate Festival is $75 and includes over 75 wines, plus a variety of gourmet chocolates, cheeses, and desserts.In addition to savoring the wonderful wines, we can also take care of all of your Valentines shopping needs. Wine makes the perfect gift! Enjoy a 25% discount on all wines, baskets, and holiday items purchased during the event. 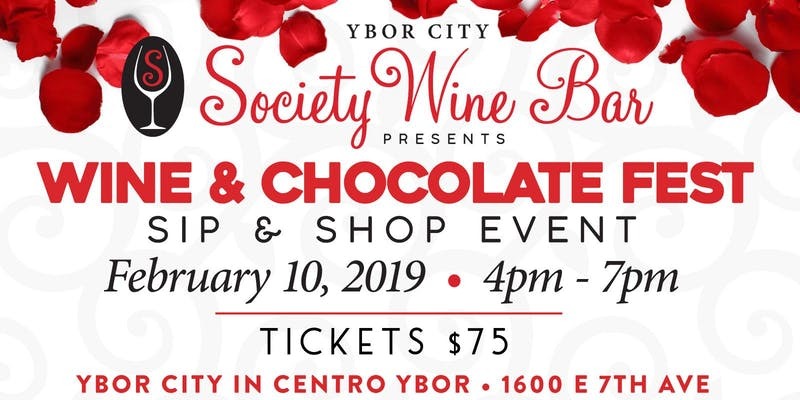 We will have complimentary gift bags, tissue and wrap to get you all set.If you have any questions, please feel free to call us at 813- 999-4966 or email us at Info@YborCityWineBar.com.---The Ybor City Wine Bar is located on the 1st floor of The Centro Ybor Complex in the heart of the Ybor City Historic District - 1600 E 7th Ave., Ybor City (Tampa), FL 33605Tickets may also be purchased in both our Ybor City and Seminole Heights locations, as well as our new South Tampa location (opening soon)!